Most people love to keep their homes clean and frequently spend some time every day or week to make sure that it reflects their personality. However, for various reasons, pests make their way into homes at will and take over. It is an unpleasant experience to see bed bugs on your expensive Egyptian cotton bed sheets and cockroaches walking in the kitchen cabinets containing your fanciest china. You need to take action before it is too late. Pests, whether they are cockroaches, mosquitoes, bed bugs, spiders, etc., are not just annoying. They carry allergens, disease-causing bacteria and viruses. You may be able to deal with a few pests that you see in your home but only a professional Toronto pest control company will be able to the destroy their nests and breeding grounds. If you buy pest-control sprays, creams, and chemicals from the market, they are not as potent and may only be effective enough to repel the pests for a short period of time. Once the effect of that chemical fades away, these pests will come out again. Professionals will use effective and strong chemicals to make sure that your house is pest-free for a relatively long time. Most companies offering residential pest control in Toronto offer guarantees and stand by their work. If you find that after the first treatment the pests are still present, the company will carry out the treatment again at little to no extra cost to you. They will locate the source of infestation and eradicate it completely. Most pests damage the carpets, furniture, walls, clothing, etc. when they attack a house. 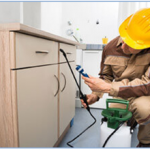 A professional pest control company will work carefully to minimise further damage to your belongings and carry out the pest control processes effectively.